On the Saturday before Christmas we went to Pigeon Forge to visit the Titanic Museum. Something I have wanted to do for a long time and cannot believe I waited so long to do. I’ve been fascinated by the Titanic for years, and long before the movie, which I am not ashamed to say I liked. I remember learning a little about it in History class. As I got older, and technology improved, I researched more about the fateful ship. Getting to share the Titanic Museum experience with my son, was a blast. I knew he would enjoy it, but was impressed with just how much he got into it. When we arrived, two gentlemen were waiting outside to welcome us aboard and give us our boarding passes. Cody loved this right from the get-go. You see, the boarding pass was in the name of one of the original people to have departed Southampton, England, on April 10, 1912. The pass had the name, whether you were a 1st, 2nd, or 3rd class passenger, your age, residence, and some information about you. At the end of the tour is a memorial room where you can see if they survived or perished the night the Titanic sunk. My son’s boarding pass – Rev. Byles. 2nd Class Passenger Age: 42. Residence: Essex, England. He was one of three priests on board. My husband’s pass – Patrick Canavan. 3rd Class Passenger. Age: 21. Residence: Knockmaria, County Mayo, Ireland. My pass – Victorine Chaudanson. 1st Class Passenger. Age: 36. Residence: Haverford, Pennsylvania. I’ll tell you their fates at the end of my review. Before you start they also give you an audio device. Along the museum there are numbers – for adults, as well as a more children-friendly version – that you press into the audio device and listen to a description or story that explains what you are looking at… my son and husband listened to it more than I did. I preferred to just look and read everything at my own pace. There’s lots of letters written by passengers of the Titanic or their family members. It was quite enjoyable to read them. My favorite part of the tour was the grand staircase. It truly was/is beautiful. I love that the flooring looked like marble but was something new and trendy of the time… linoleum. It was a big deal in it’s day. My son loved the iceberg he could touch and the water that you stick your hand in and feel how cold it was that night. He held his hand in for about a minute. “I can’t believe people had their whole bodies submerged in water that cold!” It definitely hit home for him. He also loved the ramps that demonstrated the steepness/angles of the ship during the various stages of the sinking. At the end of our tour we discovered that Rev. Byles died helping to save others. Patrick Canavan also died, but Victorine Chaudanson survived. My son said that he was glad that Rev. Byles was able to help people before he died. I would highly recommend anyone give the Titanic Museum a tour, especially families or school organizations. Or if you’re a history buff, like me. Everyone we encountered at the museum was very friendly and helpful. It was a very good day. My only complaint is that no photography is allowed. I would loved to have taken pictures. Disclosure: I was provided tickets to tour the Titanic Museum to facilitate my review. No other compensation was received. As always, my opinions are 100% my own. I really would love to go to this Museum! It sounds like such an interesting place to go to! I like museums, and the heritage at this one is awesome! I went there last year and it was amazing! I LOVE this place. I could spend hours in there. I need to hit the exhibit that is here in Atlanta. We almost went there last year when we were in the mountains. Now I really wish we had.I’m a history buff anyway. This article is great. I think we will put this on our “to visit” list for 2013. Thanks for the review! Can’t believe we made the trip to Pigeon Forge & didn’t take this in! This would be a wonderful place to visit, the story of the Titanic is a tragic one. I would love to go to this museum!! I loved the movie Titanic. I would love to go! Thanks for sharing. Great review. I would love to visit that museum! Too bad about not being able to take pictures though. Wow, sounds like they do a great job of immersing you in the experience of the Titanic. Next time I’m down that way, I will have it on my list. Very interesting! I’d love to be able to visit one day! I’ve also been fascinated by the Titanic for a long time. I went to an exhibit in a nearby city last spring and I loved it! We have a similar exhibit here in Vegas & I LOVE it! The iceberg really does make you pause- I can’t even imagine dying in water that cold. Oh my how beautiful! I live about 2 hours from Pigeon Forge and Gatlinburg and we use to go there all the time. Unfortunately,in the last few years due to health problems we have not been able to go since they put in all the new things there. I can’t wait to get to go there again! Would love to visit next time we are up. I did not realize there was a museum for the Titanic. This was a great review and you may think I am a softy but it did bring tears to my eyes when your son commented on Rev. Byles final moments. Thank you for the review. I really want to go but boo that you can’t take pictures! I went to the Titanic exhibit at Myrtle Beach one year at the Ripley’s Aquarium and it was neat. They had water you could put your hand in that was as cold as the water that night. Brrr! Omg, I might cry if I went, but how romantic and wonderful! I was here last year and it was amazing! I would give anything to see this. I bet it is amazing. I love that movie and all the history with that ship! I really love how the Titanic Museum put everything into “realization” so that everyone could truly comprehend what took place on that fateful night. I hope to one day visit this museum with my family as well. Thanks for the share! What a fun family trip! Pigeon Forge is not far from me. I know my stepdaughter would just love to go to see this. Thanks for the great vacation idea! What a wonderful review! I would LOVE to see this! Wow, that’s awesome!! 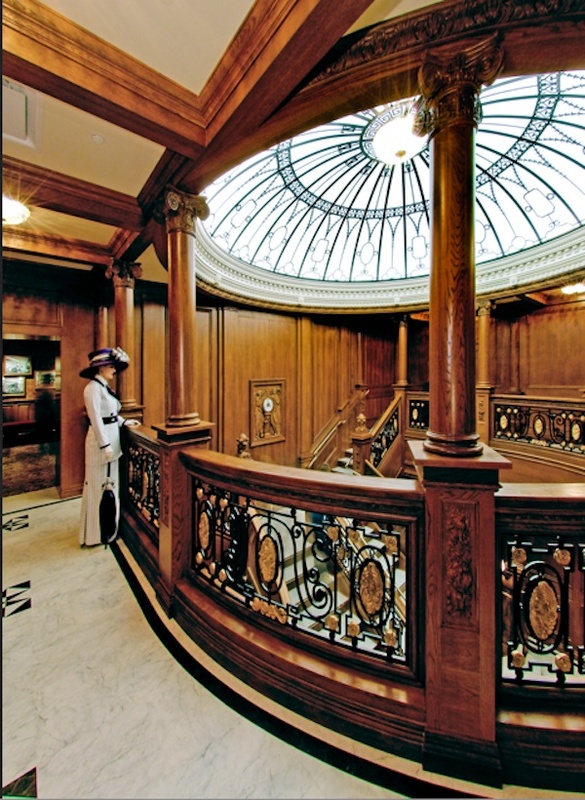 I have always loved the story/history of the Titanic and had never heard about this museum! Really like the way they give you the name of a person who was on it. Would love to visit!! Wow, I can only imagine how amazing that staircase would be. I have got to go! Your tour sounded fantastic. I didn’t know they have a Titanic museum there.I always associated that plac with Dollywood.I haven’t been there either. Have to plan a road trip now. Very interested in the Titanic. Thank you so much for the review. We are planning a trip to Pigeon Forge the end of the month and this was on our list as a possible place to visit. We will definitely plan on a visit now. THE NEXT TIME I GET TO TENNESSE I WILL GO TO THIS…HAPPY NEW YEAR-THANKS FOR THE INFO.. Sounds like a fun time and educational as well. I would love to go see this place one day, it sounds amazing! This is so interesting. My cousin and I went to a close by city of ours last year to a Titanic display which was so much exactly what you went to see. I still have my card for a person that was on the Titanic. Anyone who gets a chance to go, please go you wont regret it. Thanks for reminding me of my visit of the Titanic show. This looks like a great place to take my family for vacation. Defiantly tops my list for places to go. Thanks for the great post.